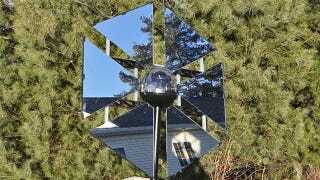 Instead of an electricity generating solar panel, a motorized sun-bouncing mirror known as a heliostat is another approach to solar-powered lighting. And for just $400 the SunFlower will redirect up to 50,000 lumens of sunlight directly into your home. Heliostats are already popular in industrial applications, but typically come with industrial-sized price tags. So the SunFlower was designed to be both affordable and consumer-friendly. Meaning you don't need a degree in engineering to get it running. You quite literally just mount it to a pole, position it so the sun is bounced where you need it, and walk away. It's completely solar-powered, and will automatically adjust the position and angle of the three-foot wide mirror array to keep the sun always shining where you specified.